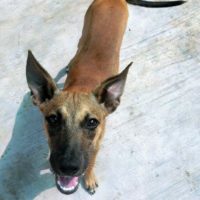 Cappuccino is one of five “coffee pups” that were found running through the streets in Mexico, and was rescued as a baby. She is the shyest of her siblings and will need a patient owner who will help build her confidence with loads of positive reinforcement. Cappuccino likes to be with people of all ages and enjoys affection. She is still working on respecting personal space so if you are considering adding this gorgeous girl to your home with small children, some work on “down” will be a top priority. Her intentions are full of love and her pouncing is only to bathe her people in kisses. As with any young pup, Cappuccino is in learning mode. Her foster family is working on house-training, as well as a few tricks! Her leash skills are great! Cappuccino is smart and gets guidance from her sister Latte (who shares a foster home) and would do well adopted with her sister or as an addition to a family with a calm dog. She can definitely manage as a single pup in a nice quiet home, switching her focus to her humans for guidance as she experiences many “firsts” in life. IDEAL HOME: Fenced yard, people to hang out with all day, her sister Latte would be a bonus! Cats are cool too.